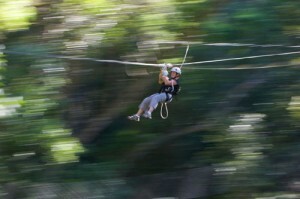 takes place in the magnificent Tsitsikamma indigenous rainforest. Many of the platforms are built around giant Outeniqua Yellowwood trees that are up to 700 years old! Standing within the crown of these giants and looking down at the lush forest floor thirty metres below is an experience of a lifetime. The scenery and birdlife is spectacular and professional guides ensure your safety while keeping you informed about interesting features of the forest ecology. If you are fortunate enough, you will spot a pair of Knysna Loeries or the brilliant red plumage of the elusive Narina Trogon. Whatever happens, we’re quite sure you’ll be back again! Located at Storms River Village, 45 minutes from Plettenberg Bay and 1hr 30mins from Port Elizabeth. Bookings are essential.